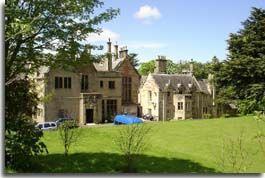 Hollybush Mansion House is situated about 5 miles east of Ayr. The land of Hollybush was purchased by Frederick Andrew Eck from a Mr. Hunter of Doonholm in about 1852. The construction of the house began soon after to the designs of the arhitect James Paton. The house was altered in 1919 by the architect James Kennedy Hunter, and redisigned in 1926 by the architect James Carrick. A good man and true, who spent twenty years of his life on the banks of the Doon, has gone to his rest. Mr. Eck, formerly of Hollybush died on Saturday last at his residence in Cromwell Rd. London, in the 78th year of his age. He bought Hollybush estate from the late Mr. Hunter of Doonholm about the year 1852. He built a fine mansion upon it, and the beautiful grounds will long bear testimony to his good taste. Mr Eck was a native of Geneva (Nevey [=Vevey]) but came early in life to London, and after receiving a mercantile training, he became a partner in the firm of Anthony Gibbs and Sons. For a dozen years, he was managing partner in Chili, where the firm had a most extensive connection, especially in the mining business. At that time, he had opportunities for forming a rare collection in mineralogy, which was arranged with care in Hollybush House, and afterwards in London. Successful in his mercantile career, he was able to retire from business with an ample fortune at a comparatively early age. He was a man of high culture. He spoke English, French and Spanish with almost equal facility, and wrote other languages with ease and grace. But his disposition was retiring, and the range of his knowledge, and his varied accomplishments were known only to a limited circle. The death of his only son [William], a gentle and gifted boy, threw a gloom over him in the decline of his life, and induced him to part with Hollybush, where every scene brought up tender recollections. On leaving the place, he settled a sum in the hands of trustees sufficient to yield about 10 pounds per annum to be spent at Christmas in gifts for humble villagers in Dalrymple. Dying at a ripe age, he has left a widow - a Glasgow lady - and three daughters to cherish his memory." Frederick Eck is beleived to have died aged 78 at Cromwell Rd /London, possibly in 1884. His collection of about 3000 specimens, mostly minerals, but also inlcuding significant cut gemstones, and fossil, numismatic, archaeological and ethnographic material, was donated by "his family" in 1884 to the Hunterian Museum/ University of Glasgow. The house with its 25 bedrooms is now one of three homes run by The Ex-Services Mental Welfare Society known as COMBAT STRESS.